California Reproductive FACT Act challenged by crisis pregnancy centers. Can California make crisis pregnancy centers say what they really are? 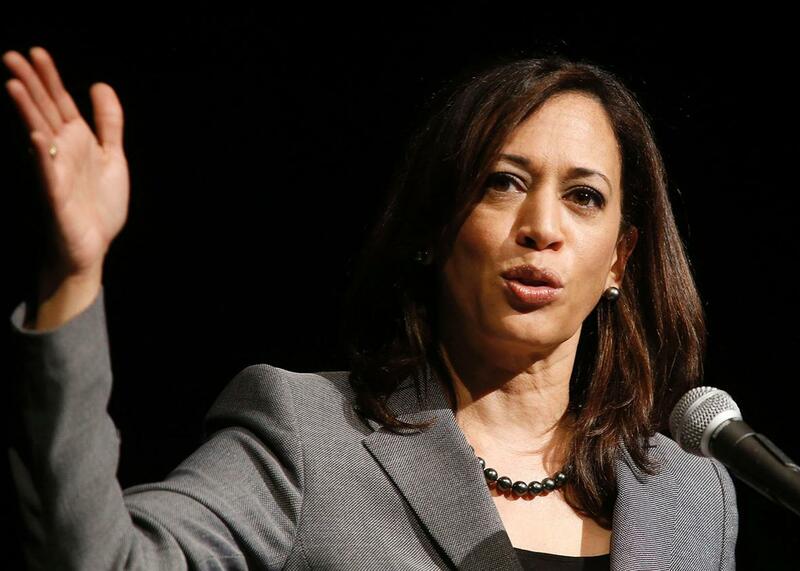 California Attorney General Kamala Harris speaks on the campus of UCLA on Jan. 30, 2015, in Los Angeles. The U.S. Supreme Court has long been signaling an almost infinite tolerance for claims that religious freedom and the freedom of speech—especially when combined—can be a sprawling and effective means of achieving whatever ends you may desire. Now California’s new efforts to regulate its 300-plus crisis pregnancy centers are being challenged in the courts on precisely those grounds. Only days after California’s governor signed into law a measure that would require crisis pregnancy centers to notify their patients about how to obtain birth control and abortion services, two such clinics, both ministries of churches, sued California Attorney General Kamala Harris, claiming the new law unconstitutionally violated their speech rights and religious freedom. The 18-page complaint asks the court to declare the Reproductive Freedom, Accountability, Comprehensive Care and Transparency (FACT) Act unconstitutional and bar its enforcement. Many states have been trying to shut down women’s health clinics while simultaneously pouring millions of dollars into crisis pregnancy centers. The name implies that these centers are medical facilities, and Molly Duane outlines some of the problems with this implication in the Cardozo Law Review: The numbers of CPCs are on the rise, while abortion clinics are being regulated out of existence. CPCs often open near abortion clinics and present themselves as providers of a range of pregnancy services, yet they often offer very limited services and factually discredited information to women facing unintended pregnancies. CPCs usually advertise to women who think they may be pregnant, and they do provide pregnancy tests, information about adoption, financial assistance for baby clothes and supplies, and counseling services that strongly discourage abortion. This counseling often uses scientifically disproven arguments about heightened risks of suicide, breast cancer, and infertility after an abortion. Frequently no medical professionals are on staff, although staff may wear white coats. A major congressional report conducted in 2006, often referred to as the Waxman report, documented these deceptive practices, finding that in addition to the false health information CPCs provide, they also give pregnant women patently inaccurate information about other areas of fetal development. For example, one CPC website cautions: “a few days after your missed period, the baby’s heart begins to beat.” This despite the fact that the American College of Obstetricians and Gynecologists states that most fetal hearts begin to beat near the end of the first month of pregnancy. The strategy CPCs engage in is to delay a woman’s choice for abortion until it’s almost impossible to obtain one. In some states, that only requires a few weeks’ delay. To be perfectly clear, while abortion clinics are being shuttered by state regulations that require them to look and feel like hospitals, CPCs are springing up in their stead. They try to look like abortion clinics without any information or referrals about termination. The point seems to be to give inaccurate information under the guise of counseling, while obviating the possibility of abortion. The two CPCs challenging the California regulations are open about the fact that due to religious objections, they do not give referrals for abortions. This facility is not licensed as a medical facility by the State of California and has no licensed medical provider who provides or directly supervises the provision of services. The new law subjects violators to a $500 civil penalty for a first offense and a $1,000 penalty for each subsequent offense. Several cities—notably Austin, Texas; Baltimore and other parts of Maryland; San Francisco; and New York City—have attempted to pass regulations that would have CPCs post signs in their waiting rooms stating that they do not provide abortions or abortion referrals and/or have no licensed medical professionals on staff. But in most of these cases, the federal courts have struck down the parts of laws forcing CPCs to post such signs. Applying the highest level of constitutional scrutiny, the federal court in Baltimore, for instance, found that the local ordinance unconstitutionally discriminated against a particular religious viewpoint. Other courts have been similarly inclined to protect this speech. But as Meaghan Winter writes, so much of the legal controversy around these efforts to regulate CPCs turns on whether the regulations target commercial or political speech, especially in the new religious-freedom world after Hobby Lobby. “Forcing a religious pro-life charity to proclaim a pro-abortion declaration is on its face an egregious violation of both the free speech and free exercise clauses of the First Amendment to the Constitution,” said Brad Dacus, president of the Pacific Justice Institute, which brought the lawsuit, in a press release. Perhaps that’s the most maddening aspect of the objections to the FACT Act. They come from the same abortion opponents who have been eager to pass regulations that would force physicians to provide inaccurate medical warnings to women seeking to terminate their pregnancies. After the court blessed precisely such informed (more accurately misinformed) consent statutes in Planned Parenthood v. Casey, a raft of states passed laws forcing physicians to warn women of all sorts of medically dubious links between abortion and negative health outcomes. Courts have seemed to analyze laws that would force physicians to deliver the same discredited warnings CPCs offer pregnant women (suicide, breast cancer, regrets) under less rigorous First Amendment standards than those that try to regulate CPCs. As a result, CPCs usually win their speech claims, and physicians lose—or at least they did until last spring, when the U.S. Supreme Court decided not to disturb a federal appellate ruling doing away with a North Carolina forced ultrasound law, which was challenged on First Amendment grounds because it compelled doctors to deliver an openly anti-abortion message on behalf of the state. It’s not at all certain that California’s FACT Act will withstand a First Amendment challenge from the CPCs. But it’s heartening to know that the courts might finally begin to apply the same standards to evaluate compelled speech claims by abortion providers that they do to CPCs. In either instance, women should be given more information, not less. In either instance, health care and religion should be marketed as separate and distinct services. And in either instance, a woman’s health and autonomy should trump the state’s desire to make her choices for her.